Background: Lumbar pedicle screw insertion involves a steep learning curve for novice spine surgeons and requires image guidance or navigation. Small volume centers may be handicapped by the lack of cost-effective user-friendly tools for preoperative planning, guidance, and decision making. Objective: We describe a patient-specific interactive software module, pedicle screw simulator (PSS), for virtual preoperative planning to determine the entry point and visualize the trajectories of pedicle screws. Materials and Methods: The PSS was coded in Python for use in an open source image processing software, 3D Slicer. Preoperative computed tomography (CT) data of each subject was loaded into this module. 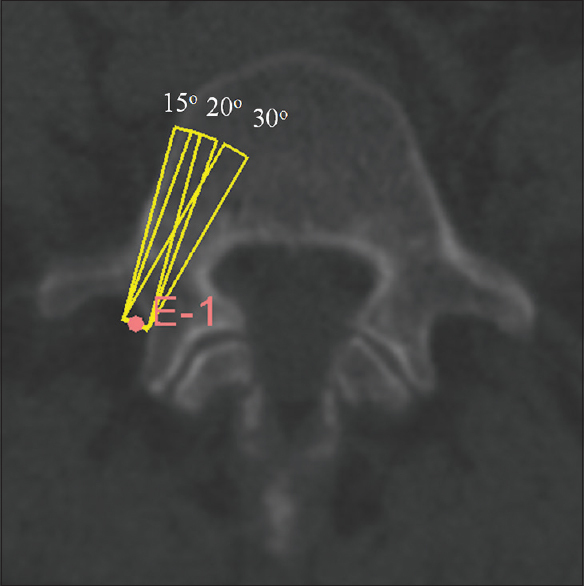 The entry-target (ET) mode calculates the ideal angle from the entry point through the widest section of the pedicle to the desired target in the vertebral body. The entry-angle (EA) mode projects the screw trajectory from the desired entry point at a desired angle. The performance of this software was tested using CT data from four subjects. 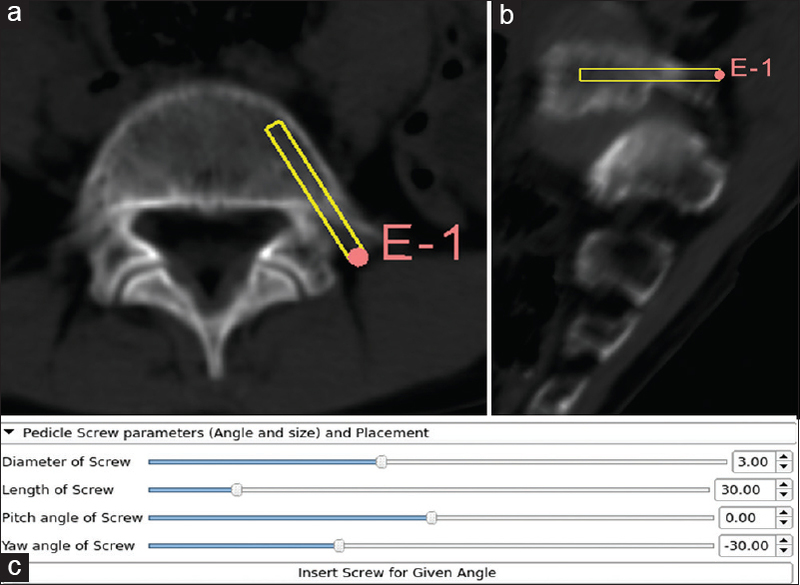 Results: PSS provided a quantitative and qualitative feedback preoperatively to the surgeon about the entry point and trajectories of pedicle screws. It also enabled the surgeons to visualize and predict the pedicle breach with various trajectories. Conclusion: This interactive software module aids in understanding and correcting the orientation of each vertebra in three-dimensions, to identify the ideal entry points, angles of insertion and trajectories for pedicle screw insertion to suit the local anatomy. Key Message: An interactive software module has been proposed that provides orientation of each vertebra in three-dimensions, and identifies the ideal entry points, angles of insertion and trajectories for lumbar pedicle screw insertion. In 1969, Harrington and Tullos described insertion of a screw through the isthmus of the pedicle in an attempt to reduce two cases of high grade spondylolisthesis. The use of pedicle screw internal fixation has continuously evolved ever since and was endorsed and accepted by the North American Spine Society in 1993. Use of pedicle screw instrumentation has not been hassle-free and has been associated with screw malposition, damage to the nerve root, spinal cord, and vascular structures. Expertise required in this procedure may be thoroughly underestimated in large volume centers, where PACS (Picture Archiving Communication System), image guidance, and navigation are readily available. Small volume centers with limited radiological facilities and resources may be handicapped due to lack of cost-effective and user-friendly tools for preoperative planning, guidance, and surgical decision making. Pedicle screw insertion is challenging and involves a steep learning curve for the novice spine surgeons, and more so, in cases with an abnormal spine morphology. In an attempt to eliminate this, various authors have described computer assisted and image guided techniques for pedicle screw insertion. However, there are limited numbers of cost-effective software in clinical practice, which can quantitatively calculate the angles and enable visualization of the various possible trajectories through the pedicles during the preoperative planning. Here, we describe a patient customized interactive software module to aid in determination of the entry point and trajectory of pedicle screws. This project was approved by the institutional review board (IRB no: 11418). The pedicle screw simulator (PSS) was developed as a module for use in the 3D Slicer environment [http://www.slicer.org, Surgical Planning Lab (SPL), Brigham and Women's Hospital (BWH), Boston, MA, USA], an open source platform for medical image informatics, processing, and analysis. This was coded in Python language. 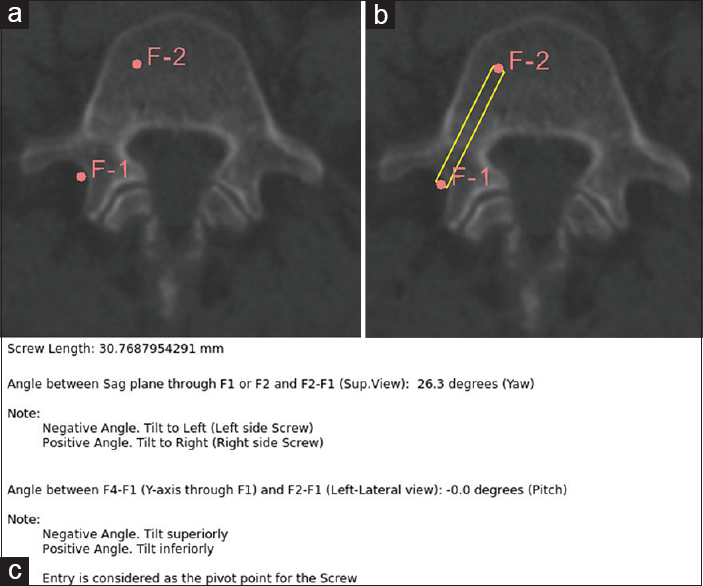 Preoperative computed tomography (CT) spine data were uploaded into the module and were used to calculate the screw angle and enable visualization of the pedicle screw entry point and trajectories. The CT data were acquired in prone position in a Siemens Emotion 6 CT scanner with 1 mm collimation and 0.75 table pitch. The X, Y, and Z spacing (slice thickness) of CT data were 0.586, 0.586, and 1 mm, respectively. The interslice gap between the axial slices was 1mm, which provided consecutive axial slices without any gap. The matrix size of each slice was 512 × 512. The left–right and posterior–anterior field of view (FOV) was 300 mm covering bilateral iliac bones. The inferior–superior FOV was varied based on the level of the vertebrae. The X, Y and Z axes of the imaging system were considered as the frame of reference. The spine was not aligned with the frame reference of the imaging system during the imaging procedure. The preparation part of the software module performed the alignment of the spine with the imaging system frame of reference. Fiducials were marked manually to enable the software module to calculate the orientation of the vertebra with respect to the imaging system frame of reference. This deviation was displayed on the control panel and the software realigned the selected vertebra with frame of reference of the imaging system. The process was achieved with the aid of push buttons in the control panel [Figure 1]. A cylinder model was created to simulate the screw placement using VTK (Visualization Tool Kit), an open source software for three-dimensional (3D) computer graphics and visualization, which is freely available as a part of 3D Slicer. The screw diameter was selected in increments of 1 mm from the slider widget by the user. The length of the screw was calculated as a Euclidean distance between the entry and target fiducials. There was also a provision for the user to determine the screw length from the slider widget. Volume rendering of the CT data was used to generate 3D visualization of the spine. Two modes of trajectory planning were created in the control panel viz., ET (Entry-Target mode) and EA (Entry- Angle mode). Using the cross-hair in the 3D Slicer toolbar, the desired vertebral level was chosen first. Rotation of the vertebrae was corrected as described in [Figure 2] and [Figure 3]. When a new vertebral level was chosen, the slices were re-oriented to the original image orientation by selecting “Reset Angles” button [Figure 1]. In the ET mode, after correcting for rotation of the vertebra, the entry and target fiducials were chosen for the desired pedicle screw by visualizing the fiducials in axial, sagittal, coronal sequences, and 3D volume rendering view. After selecting the fiducials, the pitch and yaw angles for the desired pedicle screw was calculated by the software and displayed in the PSS control panel, as shown in [Figure 4]. The desired diameter of the pedicle screw was chosen in the slider widget in the PSS control panel, as shown in [Figure 5]. The “insert screw for given entry and target” button was used to visualize the trajectory of the pedicle screw. The length of the screw was displayed in the control panel based on the Euclidean distance between the desired entry and target fiducials [Figure 4]. In the EA mode, the appropriate entry point fiducial was chosen by visualizing the axial, sagittal, coronal sequences, and 3D view. The desired pitch, yaw angles, length, and diameter of the pedicle screw were entered in the slider in the PSS control panel by the user. The “insert screw for given angle” tab button was enabled to visualize the desired pedicle screw [Figure 5]. Here, we illustrate four cases where PSS was used in the preoperative planning and visualization of pedicle screws. 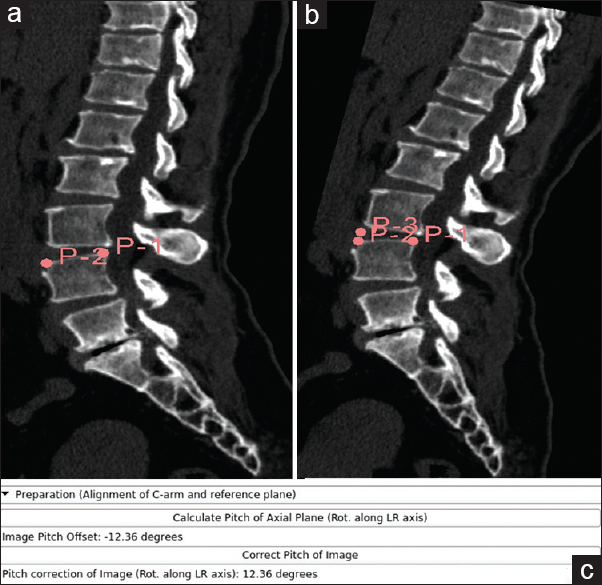 PSS enabled the surgeon to determine the entry point and trajectory of pedicle screws. It provided an interactive environment for visualizing all possible trajectories by varying the angles and using multiple entry points. This is a patient with grade III L5-S1 spondylolisthesis. [Figure 6] demonstrates the use of EA and ET modes in surgical planning. This is a patient with grade II L5-S1 spondylolisthesis. [Figure 7] demonstrates the use of ET mode in surgical planning. This is a patient with grade II L5-S1 spondylolisthesis. 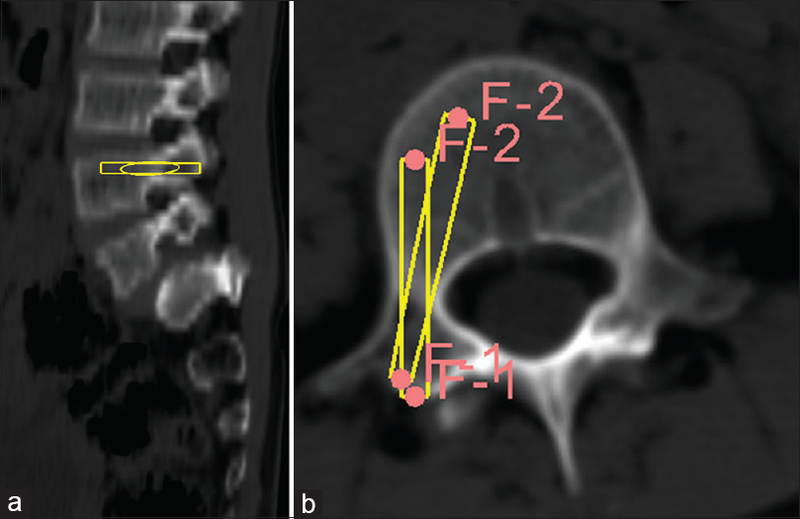 [Figure 8] demonstrates the various possible trajectories from the same entry point with various angles and the grade of breach in the pedicle. This is a patient with L4-5 grade II spondylolisthesis. [Figure 9] demonstrates the various possible trajectories with various entry points. Pedicle screw insertion is a challenging procedure with a steep learning curve. The procedure is not hassle free and can be associated with malposition leading to nerve root damage, vascular, and cord injuries.,,, There are various systems of intraoperative computer navigation, but these are generally expensive and not available at all centers. There are very few applications or software aiding the surgeon in preoperative simulation. The need for simulation models, especially for spine surgeons early in their early career, has been emphasized by Song et al., In our software, we have made provisions to visualize, calculate, and correct the tilt and orientation of the vertebral body in all three dimensions. We have also made provisions to choose various entry points, angles of insertion, and also to visualize trajectories. We have developed an interactive software module that uses preoperative CT spine data to aid the spine surgeons in understanding and correcting the orientation of each vertebra in three dimensions and to identify ideal entry points and angles of insertion and their trajectories for pedicle screw insertion. It would also help the surgeon to accurately choose the entry point and trajectory to suit the local anatomy. The authors thank Mr. Danie Kingslin Heck who performed image acquisition and data transfer. Gaines RW. The use of pedicle-screw internal fixation for the operative treatment ofspinal disorders. J Bone Joint Surg Am 2000;82:1458-69. Fedorov A, Beichel R, Kalpathy-Cramer J, Finet J, Fillion-Robin JC, et al. 3D Slicer as animage computing platform for the quantitative imaging network. MagnReson Imaging 2012;30:1323-41. Blumenthal S, Gill K. Complications of the Wiltse pedicle screw fixation system. Spine 1993;18:1867-71. Brown CA, Lenke LG, Bridwell KH, Geideman WM, Hasan SA, Blanke K. Complications of pediatric thoracolumbar and lumbar pedicle screws. Spine (Phila Pa 1976) 1998;23:1566-71. Faraj AA, Webb JK. Early complications of spinal pedicle screw. Eur Spine J 1997;6:324-6. Ohlin A, Karlsson M, Düppe H, Hasserius R, Redlund-Johnell I. Complications after transpedicular stabilization of the spine. A survivorship analysis of 163 cases. Spine1994;19:2774-9. Shin BJ, James AR, Njoku IU, Hartl R. Pedicle screw navigation: A systematic review and meta-analysis of perforation risk for computer-navigated versus freehand insertion. J Neurosurg Spine2012;17:113-22. Klein S, Whyne CM, Rush R, Ginsberg HJ. CT-based patient-specific simulation software for pedicle screw insertion. J Spinal Disord Tech 2009;22:502-6. Xiang L, Zhou Y, Wang H, Zhang H, Song G, Zhao Y, et al. Significance of preoperative planning simulator for junior surgeons’ training of pedicle screw insertion. J Spinal Disord Tech 2015;28:E25-9. 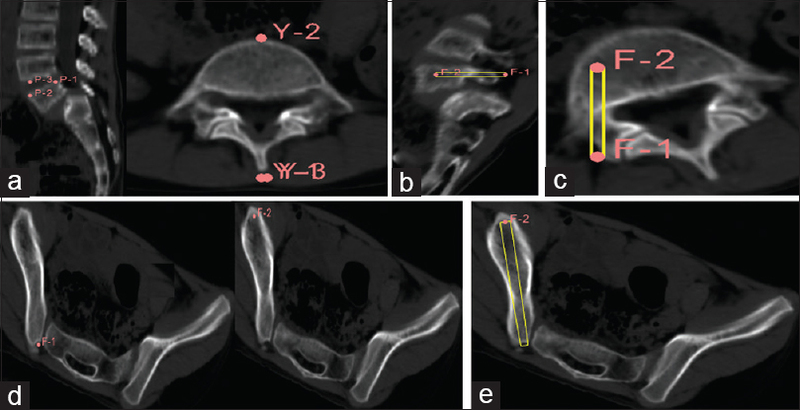 Song G, Bai H, Zhao Y, Han J, Liu X. Preoperative planning and simulation for pedicle screw insertion using computed tomography-based patient specific volume rendering combined with projection fluoroscopy. Int Rob Auto J 2017;2:00011. doi: 10.15406/iratj. 2017.02.00011.